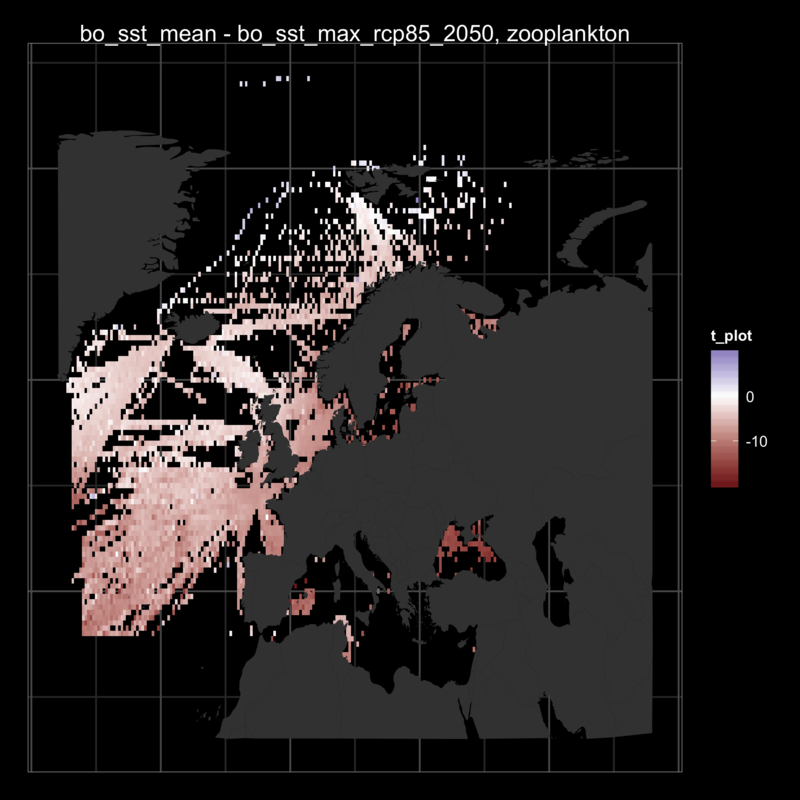 This data product shows how to derive, summarise and visualise thermal affinities for European marine species. This work is supported by EMODnet biology with additional support to TJW during development of these methods provided by the UK Marine Ecosystems Research Programme. 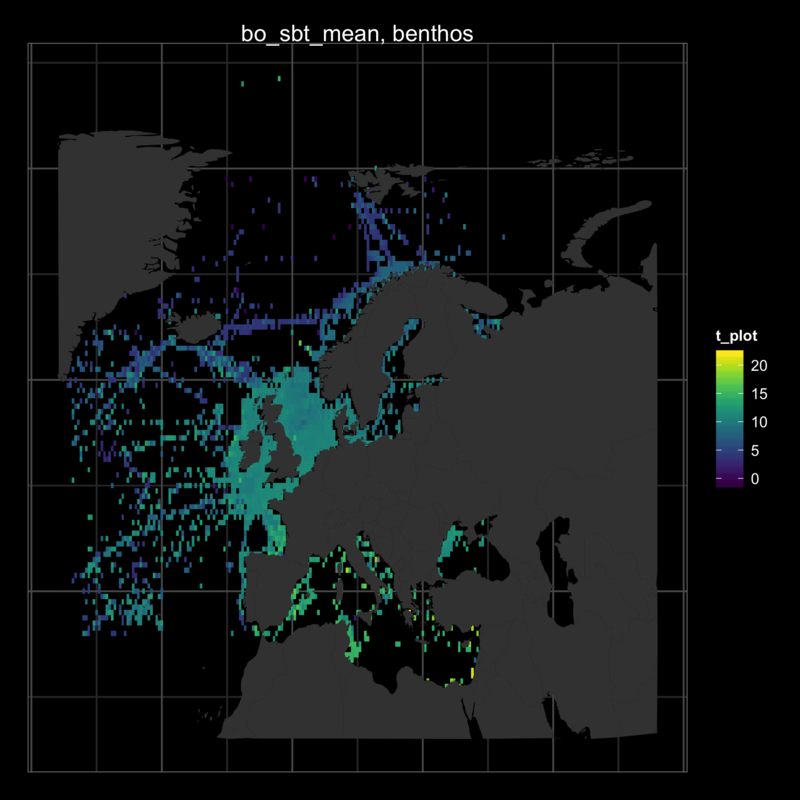 The aim is to derive thermal affinities for all European marine species, by matching occurrence records from OBIS to gridded temperature products. These species-level thermal affinities are then used to produce assemblage-level averages on a 0.5º grid covering European seas, separately for major functional groups (e.g. benthos, zooplankton, fish). Finally these gridded assemblage-level averages are compared to current and projected future sea temperatures to identify areas of high climate vulnerability for each functional group. The European species list was derived on the basis of occurrence records in OBIS. This data comes from EurOBIS and the EMODnet Biology portal. The obtained functional groups functional groups for these species using attributes from WoRMS using the worrms package. Thermal affinities were derived from all European marine species using a suite of functions described and justified in full here: https://github.com/tomjwebb/marine_thermal_traits. Briefly, for each species, all global occurrences were extracted from OBIS, these were then matched in space (latitude, longitude) to a global temperature climatology (SST and SBT from Bio-ORACLE SST and SBT, obtained using the sdmpredictors package), and in space, time (month, year), and sample depth to a global gridded temperature product (Institute of Atmospheric Physics, IAP gridded temperature). Temperatures were then summarised to provide a range of thermal affinity measures for each species (including mean, min, max, 5th and 95% quantiles, for each temperature measure). The product is a table with the thermal affinities of each species, which can be grouped by functional group to obtain 'community level thermal affinities'. With this information, we can compare the functional group-level temperature affinities to current and projected future temperature and create maps.